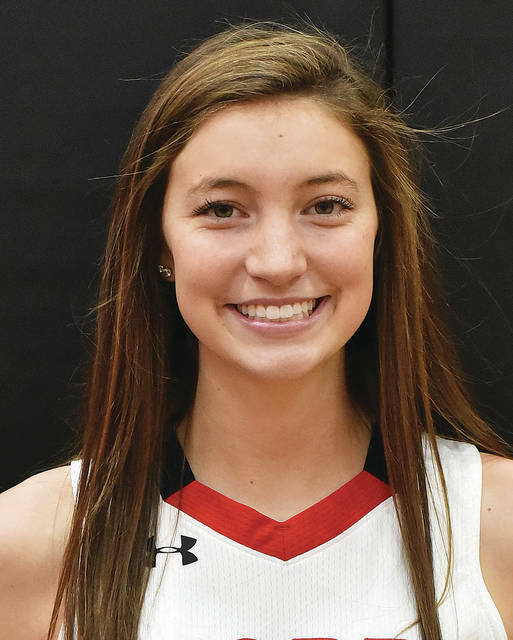 MARIA STEIN — After a close first quarter, Fort Loramie pulled away in the second on its way to a 68-50 win at Marion Local on Tuesday in nonconference action. It was the Redskins’ final regular season game. The teams traded points in the first until Caitlyn Gasson made two free throws to put the Redskins ahead. Fort Loramie led 18-17 at the end of the quarter and used a 21-9 scoring advantage in the second to take control. Though the Flyers won the third quarter 16-12, the Redskins finished with a 17-8 scoring advantage in the fourth to close out the win. Kenzie Hoelscher led Fort Loramie with 15 points and grabbed seven rebounds. Dana Rose had 11 points and Gasson, Kennedi Gephart, Taylor Ratermann and Marissa Meiring each had eight. Meiring had eight rebounds, and Gasson led the team with four assists. Fort Loramie, which is ranked No. 1 in Div. IV in this week’s Associated Press state poll, shot 23 for 55 (41 percent) from the field while Marion Local shot 18 for 43 (41 percent). New Bremen ran away in the fourth quarter to earn a home nonconference win over Botkins on Tuesday. New Bremen owned 6-4, 20-18 and 30-27 leads at the quarter breaks. The Cardinals then put it away with an 18-8 scoring advantage in the fourth, in part thanks to making 8-of-8 free-throw attempts in the quarter. Erin Smith led New Bremen with 10 points while Abbi Thieman scored nine and Madison Cordonnier and Kayla Bergman each added eight. Tiara Greve led the Trojans with seven points. It was Botkins’ last game of the season. The Raiders took a 26-18 lead by halftime and ran away in the second half of a nonconference game on Tuesday in Pleasant Hill. Jordan York led Russia with 17 points while Will Sherman scored 10. Fort Loramie used a big second half to come from behind and defeat visiting Fairlawn on Tuesday. The Redskins got off to a great start and led 13-4 early in the first quarter, but Fairlawn went a 9-3 run to end the quarter and kept the momentum going into the second. The Jets led by as many as seven points and had a 29-25 advantage at halftime. The third quarter saw both Fort Loramie and Fairlawn trade baskets with the Jets maintaining a small margin. Fort Loramie executed a backdoor set that led to a basket and a foul by Nate Meyer, which put the team up 36-34 heading into the fourth. The Redskins put the game away with a 19-5 scoring advantage in the fourth. Nathan Raterman led Fort Loramie with 14 points while Eli Rosengarten scored 11 and Nate Meyer added nine. Ashton Piper led the Jets with 15 points while Skyler Piper scored 12. Houston cruised to a home nonconference win on Tuesday. The Wildcats took a 27-11 lead by the end of the first quarter and led 44-20 at halftime. They then used a 16-10 scoring advantage in the third to push the lead to 60-30. John Leist and Peyton Arnold scored 14 points each for Houston. Tristin Freistuhler netted 13 and Jairon Douglas added 11. Covington led from the start in a home nonconference win over Lehman Catholic on Tuesday. The Buccaneers finished the first quarter on a 9-3 run to go in front 14-9. Covington increased the lead to 38-24 at halftime and led 47-36 after three quarters. Covington converted on 15 two-pointers and three 3s and made 16-of-24 free throws. Lehman made 12 two-point buckets and four 3s and was 8-of-13 from the line. Indian Lake took a 10-point lead by the end of the first quarter and cruised to a nonconference win over neighbor Riverside on Tuesday. The Pirates trailed 25-15, 40-24, 58-38 at the quarter breaks. Lane Willoby led Riverside with 20 points and 13 rebounds while Kameron Schlumbohm scored 15 points. Riverside shot 22 for 62 (35.5 percent) from the field and was outrebounded 36-30. New Bremen earned a nonconference win in Troy on Tuesday. New Bremen took a 16-7 lead after the first quarter, but the Eagles closed the gap slightly to 18-13 at halftime. The Cardinals outscored Troy Christian 9-6 in the third quarter and 23-13 in the second half, though, to close out the win. Nolan Bornhorst led New Bremen with 14 points.